Techart revealed their idea of a hot Porsche in form of the new GTStreet based on the 911 GT2 RS with 530 kW (720 PS) and 900 Nm torque. The car features a cool body kit that not only looks good,it’s also very functional. The significantly lowered front apron with a fixed carbon splitter and an adjustable splitter of hard-wearing polyurethane-RIM ensures additional downforce and due to additional air-ducts an improved airflow to the brakes and intercooler. 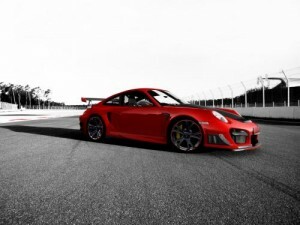 TECHART power kits are uncompromisingly sporty as well as suitable for daily on road use. These features as well as the years of experience of the TECHART engineers were given to the development of the power kit TA 097/T2.2 for the Porsche 911 GT2 RS. The overall performance of the sports car increases to 530 kW (720 hp), the maximum torque to 900 Nm. Performance-wise the GTStreet RS accelerates from zero to hundred in 3.3 seconds. After 9.5 seconds the needle passes the 200 km/h mark. With a maximum speed of up to 352 km/h the top athlete confirms his new strength in an extraordinary way. Techart has not revealed the pricing yet, but so much power and speed has it’s price for sure!